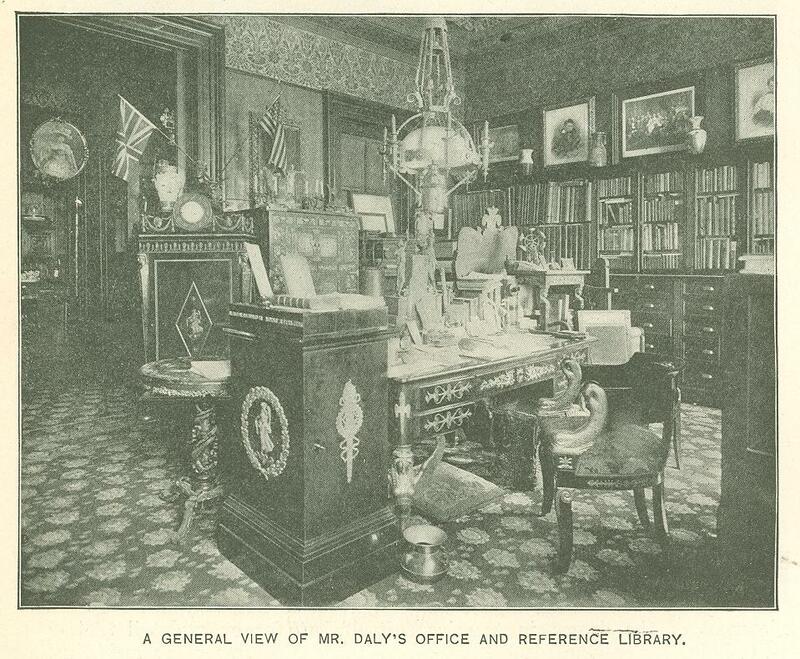 The greatest of all our stars who have risen during the past thirty years have felt and acknowledge the influence of Mr. Daly's teachings; in fact, many of them were discovered, developed, and trained by him in his theatre. Up to this present time Mr. Daly has written, adapted, and staged seventy productions of his own, has staged be­tween forty and fifty plays by other authors, has prepared and staged twenty-two comedies, and has revived fifteen Shakesperean comedies and tragedies. Moreover, Mr. Daly carefully examines every manuscript that is sent to him, and is still on the alert to dis­cover an American genius who can equal the English playwright. As yet he has not succeeded in finding one to fulfill the requirements of a serious dramatic representation, and it is rumored that to Mr. Pinero has fallen the op­portunity of writing a special play for Miss Ada Rehan. Augustin Daly's life has been a most eventful one, and if today he holds toward the drama in America the same position that Sir Henry Irving holds in England, it has been at the cost of superhuman struggles overcome by an indomitable will. He began his profession in 1860 at the age of twenty-two, while an edi­torial and dramatic writer on the New York Sunday Courier, by the produc­tion of "Leah," on December 8th, 1862, at the Boston Museum, with Kate Bateman as the Jewess. It was so great a success that. it was brought forward later at Niblo's, in New York, where it had a long run. 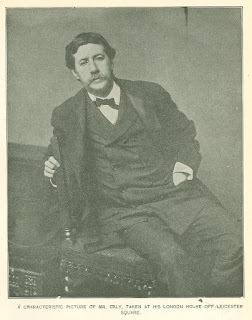 In 1864 Mr. Daly adapted three plays, "Leslie's Wedding," " Judith," and "The Sorcer­ess," which were played at the Winter Garden. Two years later, while dra­matic critic for the Express, he brought out a play based on "Griffith Gaunt" at the old New York Theatre. It ran for seven weeks, Rose Eytinge acting the role of the wife. "Under the Gaslight," produced in 1867, was Mr. Daly's first original play. It had so great a success that Mr. Daly decided to renounce his position on the Sun as dramatic critic and devote his whole attention to playwriting and producing. He presented in turn "Norwood," "The Pickwick Papers," and "A Flash of Lightning," and on August 16th, 1869, he opened his Fifth Avenue Theatre in Twenty-fourth street. The theatre was burnt in 1873, and twenty days later he opened his new theatre in Broadway and Eighth street. It was here that Clara Morris won her first great triumph as Alixe. "False Shame, or New Year's Eve," was also given, and, in a way, may be said to have fashioned Mr. Daly's career, for it led to the formation of a com­pany which, under his tuition, soon be­came the nucleus of a veritable train­ ing school of acting for those ambi­tious to excel. In December, 1874, Mr. Daly opened his new Fifth Avenue Theatre with an address by Oliver Wendell Holmes pre­ceding Alberry's comedy of "Fortune." His company at this time consisted of Fanny Davenport, Sara Jewett, Mrs. G. H. Gilbert, Nina Varian, Bijou Heron, Charles Fisher, James Lewis, William Davidge, and George Parkes. Some of the most famous plays given by this remarkable coterie of artists were: "Divorce," "Monsieur Alphonse," "Camille," "Adrienne," "The Sphynx," and "Pique," Mr. Daly's play, in which Fanny Davenport first won distinction. In September of 1879, Mr. Daly opened his present theatre at the cor­ner of Broadway and Thirtieth street. 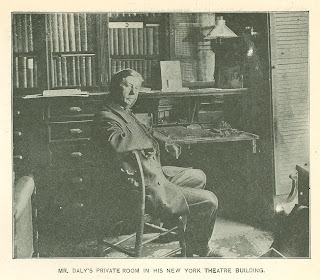 Although America cannot boast of a national school of acting receiving sup­port from an endowment, Mr. Daly has, in spite of desperate odds, fought for an artistic ideal in drama altogether removed from financial success. He has waged a single-handed battle and poured back into his work the money that his successes have brought him. Mr. Daly has a complex personality - a poet, an idealist, a man of dreams, with a tremendous capacity of bringing his dreams to a practical issue. This is a rare combination, and could only exist when a man loves his work and gives to it the full powers of his will. Originally published in Metropolitan Magazine. August 1898.